More users of Valve's Steam gaming service ran a version of Apple's Mac OS X in its first month of availability than the 64-bit versions of Windows XP and Windows Vista combined, according to a new hardware survey. A total of 8.46 percent of Steam users in May 2010 were on some version of Apple's operating system, with Mac OS X 10.6.3, Mac OS X 10.6, and Mac OS X 10.5.8. The new data is a part of Steam's monthly hardware survey, which presents data about the kind of computers users of the service have. Apple's debut compared with 6.95 percent of users on the 64-bit version of Microsoft's last-generation operating system, Windows Vista. Another 0.55 percent were seen running Windows XP 64 bit, while 0.35 percent were reported as Windows 2003 64 bit. May represents the first time that Mac OS X users have been able to officially use the Steam service within Mac OS X, since the application was released. Apple made a splash, with all listed versions of Windows losing market share when Mac OS X was added into the equation. The far-away winner remains the 32-bit version of Windows XP, which 32.89 percent of Steam gamers were running as their operating system. That was followed by 24.77 percent of users on Windows 7 64 bit, 14.66 percent on Windows Vista 32 bit, and 11.15 percent of users on Windows 7 32 bit. In an exclusive interview with AppleInsider in March, John Cook, director of Steam development at Valve, said that the monthly hardware reports could prove to be a great asset for developers who are interested in bringing their titles to Mac OS X. Details such as operating system, processor and graphics card give a clear indication how well a title will run on a user's system. "One thing for certain is that the Mac market will be a lot less of a mystery to the game industry as we add Mac hardware statistics to our ongoing hardware survey," Cook said. Steam is digital game distribution platform which has more than 25 million users and offers access to 1,100 games on the PC. Developer Valve has said it will treat the Mac as a "first-tier" platform, meaning new major titles developed for the PC will release day-and-date with the Mac. High-profile releases from Valve for Mac OS X so far have included Game of the Year award winners Portal and Half-Life 2. 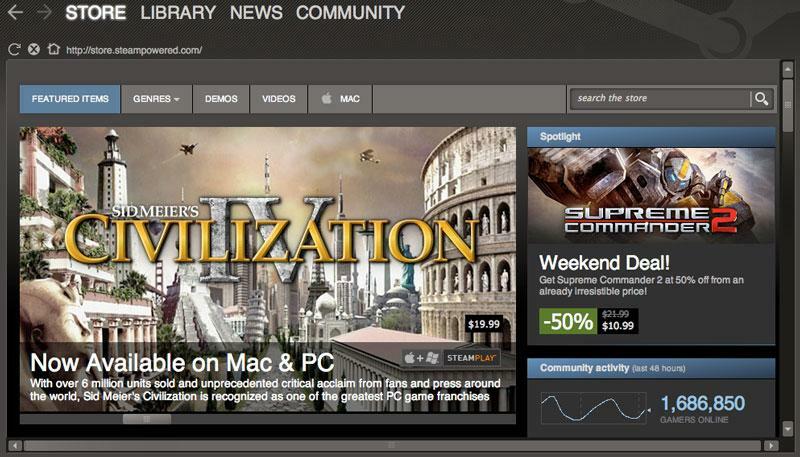 Valve has also made native OS X support for the Source engine available to licensees for use in their games. The company has also made its Steamworks suite of publishing and development tools available on the Mac platform, including product key authentication, copy protection, auto-updating, social networking, matchmaking, anti-cheat technology, and more.